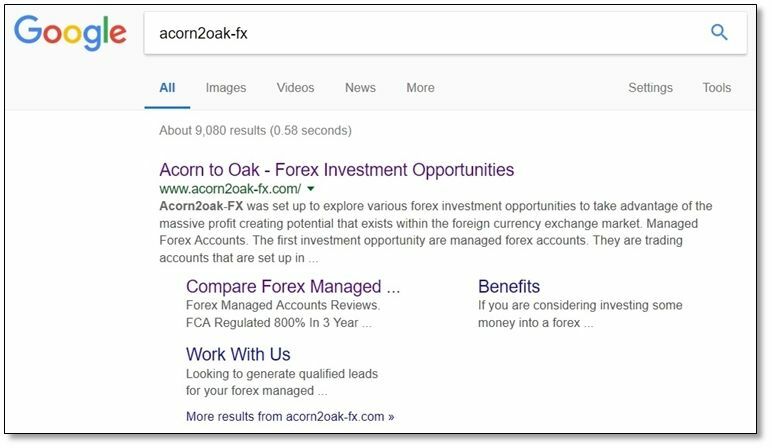 This Guernsey digital marketing article is about how to get your website ranking high in the search engines, especially Google with off-page SEO. Digital Marketing is a collective term for marketing on the internet or online. There are a number of digital channels that marketers have at their disposal such as email marketing, social media, search engine marketing (SEM) which includes pay-per-click (PPC) and search engine optimization (SEO), content marketing, video, affiliate marketing and podcasts. There are a dozen or so digital marketing companies and website designers in Guernsey that are doing a great job in most of the above marketing channels. The problem is that when the website is launched, they don’t know how to promote it properly with off-page optimisation. This is basically link building to your website. To be honest with you, I have seen some new websites that look wonderful, but the content leaves a lot to be desired; the on-page optimisation. They know how to build websites but they don’t understand content marketing, creating content in particular. 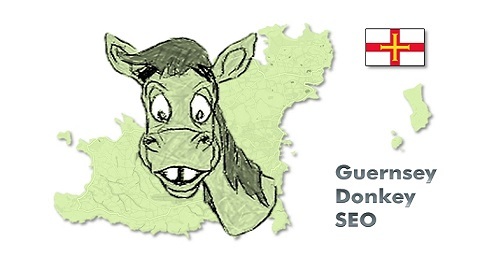 Say if you had a website about digital marketing in Guernsey and your company was called “Donkey Work“, you had a website built and your URL (website address) was donkeywork.gg. If you were a well-known established company and brand, you would get website visitors to your website without question because people would be searching for your company name. Let me show you. See the image below about one of my websites for example. It appears at the top of Google for the company name, acorn2oak-fx. This is great that you have a website and that people are searching for your company name. Your visitors can find out about your services, opening times, prices etc. The problem is if your potential visitors to your site are searching for a more generic keyword or search term. 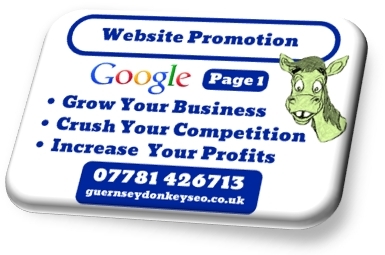 In the “Donkey Work” example, if your were to search for “Guernsey digital marketing” and your website wasn’t optimised for that search term, your website would not appear for it. This would mean that you are losing all the potential customers that search for it, and that means lots of money or leads going to a competitor, not to mention the loss of brand building. 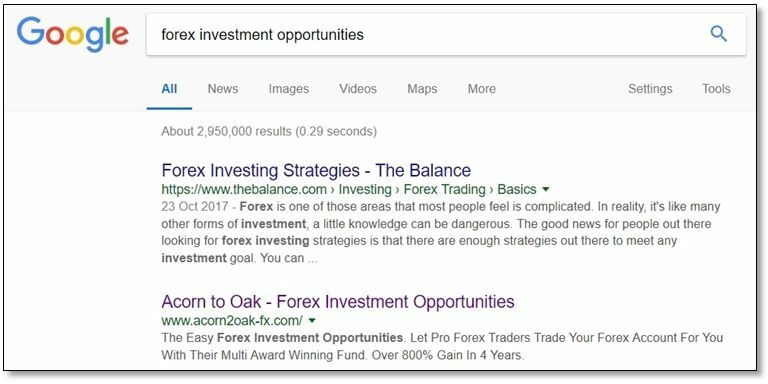 If you check out the image below about my acorn2oak site, if you type in a generic keyword “forex investment opportunities”, my website appears in position 2. My webpage is optimised for that search term. This page is optimised for “Guernsey digital marketing”. It has it in the title, the meta description and I have mentioned the term several times in the text. Not only that, but this article has many LSI (Latent Semantic Indexing) keywords in it, keywords that are contextually related to the search phrase. Although I am very good at optimising content to rank websites, that is not my objective. I will however, have to check your website to see if I can get it to rank in Google. As I said, some content is not good and it might be difficult to get the site ranked, so it will have to be amended slightly. 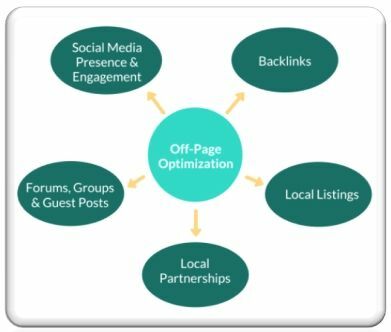 The off-page optimisation element is my focus of expertise within digital marketing. It is an absolutely massive subject and one that is constantly changing as Google changes its ranking factors on a very regular basis. There are over 200 ranking factors that go into Google’s algorithm that decides where to place a website in its search results. The term off-page optimisation is used for anything that doesn’t take place on the actual website itself. Basically driving traffic to your website though actions taken outside of your own website and to influence your position within the SERPs (search engine results pages). Backlink creation is the nucleus of off-page SOE. Search engines, Google predominantly, use backlinks as an endorsement from other websites to the quality of the site that is being linked to. Therefore, a site with a lot of backlinks that come from websites that have a high domain and/or page authority, will typically rank in a higher position than a similar site with fewer and less powerful backlinks. There are many ways to get backlinks. Naturally occurring (organic) backlinks, are some of the best ones that you can get. These are backlinks that other website owners have put on their website linking to your site because they like the content that you have on your website. They think that it will be a benefit to their website visitors. In order to gain natural backlinks, your content needs to worthwhile linking to, so it must be very informative, interesting and captivating. You need to spend time and sometimes money creating great content. Broken link building is another digital marketing technique for acquiring links from websites. You need to find websites that have broken links on their sites, find out what those links pointed to, create a better piece of content than the original and then reach out to the owner of the site with the broken links and ask them to replace the broken links with new links to your superior content. Check out the image below to see some of the other ways to get backlinks. The Google algorithm is very very clever and you need to feed it what it wants. Your website can get penalised if you break the rules. It could get relegated in the SERPs of even de-indexed completely. It can be reversed but it can be long winded and expensive to recover from. Building backlinks too quickly. You ideally have to start off with social signals and then build links slowly at first and then increase intensity and keep building consistently and evenly. If you build 100 links per day from the off, you will be penalised. If after a year into your website you throw 500 links at it, you could be penalised. Once it is established and has good domain authority, you should be safe. Unnatural anchor text. Anchor text is the text that links to your site such as guernseydonkeyseo.co.uk or Guernsey SEO. Google uses anchor text as a clue to what your site is about. If you had Guernsey Digital Marketing SEO as the same anchor text time and again, you would be penalised. Links from spam websites. Whatever you do, DO NOT PAY for links from companies that say they can get you hundreds of links for $100. 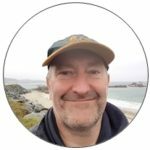 These types of “SEO Experts” use all types of black hat techniques that will get you penalised. They use link farms and blog networks that, if they are not already banned by Google, they soon will be, along with your website. I have been digital marketing here in Guernsey for many years so I understand what it takes to get a website ranking, not only in Guernsey but globally. If you want to talk about anything to do with digital marketing in general, or SEO in particular, please don’t hesitate to give me an email martin@guernseydonkeyseo.co.uk. Get Your Website On Page 1 Of Google With Guernsey Digital Marketing SEO Expert. Kick The Competition And Grab Their Ranking. Hi Martin. Thanks for this really great information on SEO digital marketing. I am giving it some thought as I have a new website that I would like to get onto the 1st page of google. Would like to keep it in Guernsey. I have read about reports of these overseas companies that do SEO for cheap but I have my reservations about them. What do you think? Thanks for your comment. Ha Ha, asking me what I think. Obviously I am going to say I can do a better job than those overseas SEO companies. In all seriousness, stay away from them. They may promise you they will do the job for a low price. They will do the job yes, but they will build backlinks from all kinds of spammy websites. They will spin old content (use old articles and change some words). It’s all unintelligible garbage. They use all sorts of websites that aren’t related to your niche or sector. At best, nothing will happen to your site, I mean no long term ranking improvement. You may get demoted. At worst, you may get a manual penalty and you could get de-indexed by Google. This is not impossible to reverse but it is long winded and will cost you money to rectify and in lost revenue. Thank you for allowing me to stress the importance of not using these iffy overseas SEO companies that use black hat SEO methods. I have used them before as an experiment on one of my other sites and it is still getting spammy links. Awful. Prices for UK SEO companies vary from £60 to £250 per hour or they offer monthly packages varying in price for small, medium and large projects. £500 to £10,000 per month seems to be the going rate. There are so many aspects to digital marketing that each website needs to be audited to see what needs doing before a price can be arrived at. A small Guernsey website for a low searched-for keyword may cost £3,000 to get a keyword ranked on page 1. 6 months at £500. You need to work out how much ROI you will get. Every website and niche is different, it’s almost impossible to give a wholesale price for every website. Please let me know if I can help you if you want me to do you off page digital marketing when you decide what you want to do. Do you guarantee first page rankings? Don’t want to waste my money. G’day Mick. Sounds like Crocodile Dundee. Nothing is guaranteed when it comes to SEO or digital marketing. 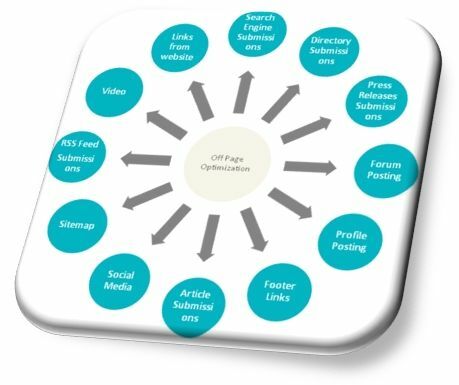 A lot of it depends on how your website is set up, what your on-page SEO is like. If your site has good architecture (structure), has good content with plenty of good keywords that relate to your service or product, LSI keywords, then there should be no reason why it won’t rank on page 1, in time. Local SEO is easier to rank for than international. A lot of it also depends on which niche, sector or business you are in. For example. Your niche I would say I could 99% say with certainty, that I could get you on page 1, probably in the top 3 positions. If you were selling swimming gear to the UK, it would be much more difficult, but doable. It would take a lot longer and cost you more money. The more competitive the keyword, the more work is required to accomplish it. Having said that, the rewards are huge. Page 1 is where you need to be. You need to work out on average how much that you get for a job versus the costs involved of getting onto page 1. Adwords is ok, but you have to keep on paying for eternity. With SEO and organic ranking, once you are on the first page of Google, most of the work is done. You just need to maintain ranking which isn’t that time consuming so not expensive. Get back to me if you want me to give your website an audit and I can come up with a price for you. How do you know how to rank if Google doesn’t publish its algorithm? This is a great question Maria. Obviously, Google isn’t going to publish its algorithm because everyone will know exactly how to rank a website. The search results would become a list of who can manipulate or follow the algorithm the best, and not the most appropriate content for the searcher. To some extent it still is a case of manipulating the rankings but it is only guesswork by the website owners. Google’s aim is to put the best content at the top of their search engines so they do issue guidelines to follow such as create great content. Great content will naturally gain backlinks, if promoted properly. Backlinks being probably the biggest ranking factor. There are some very intelligent people out there that conduct experiments on websites and they try to reverse engineer what makes a website rank high. They try to figure out the algorithm. They are quite accurate in what they find out and they issue their findings. The likes of myself follow these discoveries. We need to keep on top of any Google updates so that we can adjust our strategies accordingly.